Giving the traditional clear chicken soup an interesting twist, boiled noodles give this healthy item a significant lift in terms of the taste and feel. A patiently simmered broth with vegetables and chicken pieces make this soup a tasteful starter option before a hearty meal. Boil the chicken with 2 spring onions, 2 garlic cloves by any way you prefer. For this,I recommend using a pressure cooker since it’s more convenient, quick and results in softer chicken. However, you could use a different method. After the chicken is cooked, strain the pieces from the stock and keep the stock for later use. 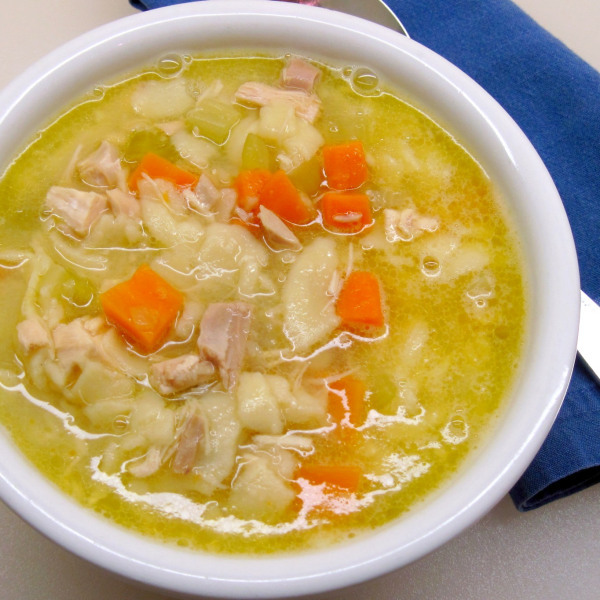 Tip: You could also use pre-cooked chicken and canned chicken stock instead of both steps above. Boil the flat noodles to desired softness or as per package instructions. Thereafter, drain them in a sieve and rinse them with cold water. Now chop the remaining spring onions, bulbs and stalks separately. Also chop the remaining garlic cloves and all the carrots. Place a deep pan over medium heat and add the butter to it. As soon as the butter completely melts, throw in the chopped carrots. Once the carrots start to soften, add the spring onion bulbs. When the bulbs turn slightly brown, add the chopped garlic and spring onion stalks. Stir and let everything cook for a few minutes. Meanwhile, shred the boiled chicken into strips or bite-sized pieces. Add the shredded chicken to the pan and give everything a stir. Now add the boiled noodles to the pan and toss everything. If the noodles are too soft, toss gently so that you don’t break the noodles up. Pour in the chicken stock and stir gently. Also pour the water in the pan, stir everything and let simmer for about 15 minutes. Season the soup with salt and ground pepper and cook for another 2 – 3 minutes. Remove the pan from the heat and pour the soup into serving bowls. You could garnish it with fresh parsley or cilantro and then serve it hot!